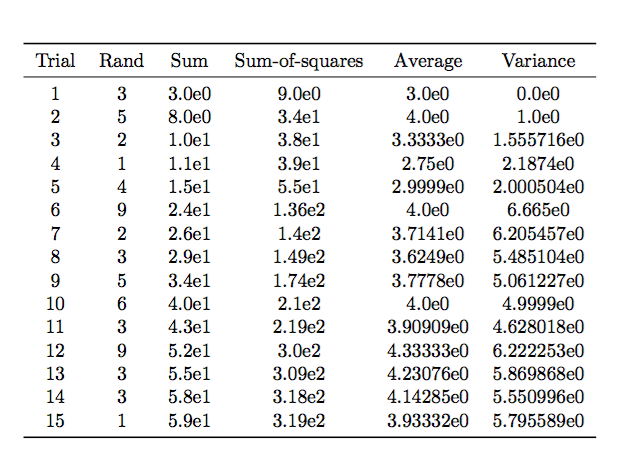 I want to create a long table containing some statistical data, such as the sample, the average, and the variance, etc. I am using the pgf package and its various extensions to do this. As you can see, the table is commented out, as I have given up on it. 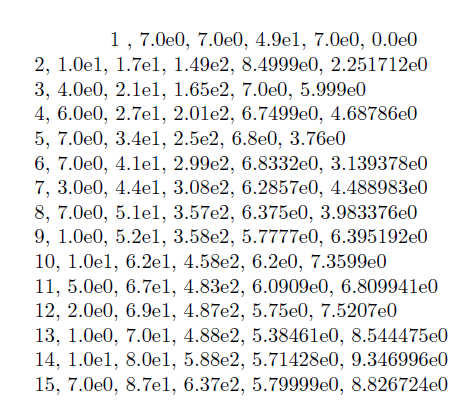 I want to generate a document like this with 1000 pages, and see the computed empirical average and variance. how to get rid of extra \hline drawn before start of longtable? Note: this question has been heavily edited due to showing signs of the XY problem. I will reask problem X in a separate question later. I suspected that your question How do I use the ampersand (&) inside a foreach or conditional (or other group/environment) when building tables? was of the XY type. The usual problem in these cases is that you cannot build a table inside a \foreach statement, because table cells form groups. The strategy is to build the table body beforehand. Here's what I get with longtable and 500 draws. I am no expert in pgfplotstable but here is an idea to build upon. To get the entries to align prettier, see Q131081. Not the answer you're looking for? Browse other questions tagged tikz-pgf tables pgfkeys or ask your own question. How can I center *and* decimal-align a PGFPlots table? How to make this table automatically? How to fit big table automatically? siunitx and summary statistics below table - separate alignment block possible? How to correctly create a macro for a table?